You are currently browsing the category archive for the ‘Item of the Month’ category. In 2009 I wrote my first Item of the Month regarding our holdings of Spanish women fashion magazines and our intention to digitize a selection of the collection to increase its access. Two years later we have completed this project successfully. Today many researchers from Spain have been downloading these unique titles. In the last two years some titles have been downloaded over 1,000 times! This numbers showcases the great popularity that this project have generated. We are proud to have made accessible this cultural heritage of the people of Spain and open up the opportunity to many other users (such as Spanish language teachers, women studies scholars, etc.) to experience these outstanding titles. Below I am re-posting the information I wrote in 2009 with update information regarding where to find these digitized titles. Enjoy! Archival collections are fascinating not only for their content but for the context of their creation and acquisition. The Spanish Periodicals and Newspapers is no exception. This unique collection of Spanish magazines and newspapers is just a tiny part of the huge book and periodical collection that was assembled by renowned Spanish bibliophile Juan Perez de Guzman y Boza, Duque de T’ Serclaes. Born in 1852 in the town of Jerez de los Caballeros, the Duke was well known by antiquarian booksellers in Spain for his exquisite taste and voracious appetite for all types of Spanish books and publications. His ability to find and acquire unique and rare materials was legendary and it was not uncommon to find specialized bibliographies of Spanish materials citing that the only copy available was in the hands of the Duke*. Toward the end of his life, the Duke collection was in deposit at the National Library in Spain, but after his death in 1934, his collection was sold in lots by his heirs. In the 1970s the Special Collections Department at the Wilbur Cross Library (the predecessor to Archives & Special Collections at the Thomas J. Dodd Research Center) acquired this collection of periodicals and newspaper through H.P. Kraus Periodicals. Today, this collection is housed in the Thomas J. Dodd Research Center. The variety of magazines and newspapers amassed by the Duke of T’ Serclaes include a great variety of literary magazines, general interest magazines (literature, sciences, and politics), religion, women and fashion magazines, and other subjects. The collection spans three centuries (18th to early 20th century) of Spanish life, culture and politics. The bulk of the collection falls between the 1800-1840, which reflects major events in history of Spain (the Napoleonic period and the Wars of Independence in Spain). Of great interest is the wide selection of women magazines written by men to appeal to a female elite audience. Ranging from literary and general interest magazines, full of short historical stories, poems, and good advice for both men and women about the proper behavior of ladies at any age, to beautiful colored and engraved fashion magazines with the latest news of Paris fashion, with music sheets of polkas and other music specifically composed for the magazines and patterns for needlework, these magazines are a window to understand the Romantic Period in Spain. For more information regarding the Spanish Periodicals and Newspaper Collection, contact Marisol Ramos, Curator for Latin American and Caribbean Collections. *See Hartzenbusch, D. Eugenio. Apuntes para un catalogo de periódicos madrilenos desde el año 1661 al 1870 and Gomez Imaz, Manuel. Los periódicos durante la Guerra de la Independencia (1808-1814). On April 27, 1877, George Willard Coy attended a demonstration at Skiff’s Opera House in New Haven, Connecticut, of an exciting new invention — the telephone — given by inventor Alexander Graham Bell. Coy, a Civil War veteran and manager of the New Haven office of the Atlantic & Pacific Telegraph Company, was fascinated by the possibilities of this invention. In November 1877 he was awarded a Bell telephone franchise for New Haven and Middlesex counties and spent the next two months getting partners and financial backing. On January 28, 1878, the New Haven District Telephone Company, in a rented storefront office in the Boardman Building at the corner of Chapel and State Streets, opened for business with 21 subscribers, each of whom paid $1.50 per month for the service. It was the first telephone exchange in the world. Prior to this time the first telephones were used privately on lines that allowed allow two people on each end to communicate over very short distances. George Coy invented the first switchboard, which, according to a writing done by the Southern New England Telephone Company (the successor to the New Haven District Telephone Company) “consisted of a wooden panel about three feet wide and two feet high, with a little shelf at its base on which the operator’s telephone rested when not in use. Across the top were four circles of contacts which resembled clock dials, each contact connected to a subscriber’s wire. In the center of each circle was a metal arm like the pointer of a clock, which could be connected with any one of the eight contact points…” Apparently Coy had to improvise in constructing the switchboard by using wires from ladies’ bustles. 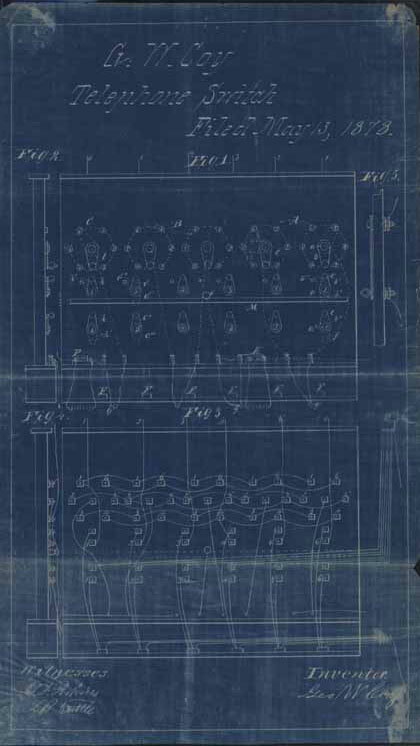 This blueprint is one of several Coy made after the initial installation of the switchboard, in an effort to patent the design. More information about George W. Coy and his switchboard can be found in the records of the Southern New England Telephone Company, a collection that was donated to Archives & Special Collections in 2003, the 125th anniversary of the founding of the company and the creation of the switchboard. Mac Barnett, a children’s book writer from Oakland with seven picture books and three novels to his credit, wrote the Picture Book Manifesto at the suggestion of one of his former professors. The Manifesto was published as an advertisement in the November issue of the Horn Book. Speaking to Sally Lodge for Publisher’s weekly (http://www.publishersweekly.com/pw/by-topic/childrens/childrens-industry-news/article/49276-mac-barnett-spearheads-a-picture-book-manifesto-.html), Barnett explains, “I think there’s a lot of hand-wringing going on now about the picture book and its place in the market and in our culture…you hear nay-sayers who think the picture book is over, and too often the pro-picture book response is that everything is fine, that the picture books are inherently magical. And great books are a kind of magic, but kids don’t need to be told that: they already know.” The proclamation was designed and executed by Carson Ellis and is signed by 20 other picture book creators, including Brian Biggs, Sophie Blackall, Laurie Keller, Jon Scieszka, and Lemony Snicket. The intended audience is everyone in the children’s literature world, including librarians, parents, writers, illustrators, editors, and publishers. Barnett hopes that publication of the Manifesto will spark conversations about picture books and how to make them more original and thoughtful, with a vitality that will make kids want to read. This month marks the tenth anniversary of one of the most difficult times in the history of the United States. Every American was touched, in one way or another, by the multiple tragedies experienced that fateful fall day. Christopher Shays, Connecticut Congressman representing the 4th district, became involved with individuals and organizations soon thereafter as a co-founded of the 9-11 Caucus (http://maloney.house.gov/911caucus/index.html) and worked with colleagues in 2005 to change rules to “bring Congressional oversight in line with the 9/11 Commission’s recommendations.” His involvement with multiple 9/11 activities is documented in his papers which are housed in Archives & Special Collections. Artists’ books have been around for a long time. Beautiful objects of art where all aspects of book making are explored and cherished: the inks, the fonts, the papers, the wrappings, the construction materials, the techniques (collages, 3-D, woodblock printing), etc. A tradition started in Europe at the end of the 18th century, today this is a worldwide phenomenon and indigenous peoples from all around the world are using their traditional practices to create artists’ books that blend the traditional with the modern, and the uniquely indigenous with other country’s traditions in bookmaking, printmaking and papermaking. The Thomas J. Dodd Research Center’s Archives and Special Collection have an extensive collection of Artists’ Books from around the world but it wasn’t until recently that we started acquiring books created by indigenous people either in their own workshops or in collaboration with non-indigenous artists. Featured in this Item of the Month is the works of Taller Leñateros, located in San Cristóbal de las Casas, Chiapas, Mexico and TALLERCONTIL from Matagalpa, Nicaragua in collaboration with artist and printer Eckhard Froeschlin from Germany. “A publishing collective operated by contemporary Mayan artists in Chiapas, Mexico. Founded in 1975 by poet Ámbar Past, the Workshop has created the first books to be written, illustrated, printed, bound (in paper of their own making) by Mayan people in over 400 years. Among its multiple objectives are those of documentation, praise and dissemination of Amerindian cultural values: song, literature, plastic arts, and the ancient Mesoamerican tradition of painted books. “The idea for this project came during a visit to the theater artist Pablo Pupiro and Ernesto Soto in 1997 in Wuppertal [Germany]. It has since been promoted within the framework of the partnership with the city of Matagalpa / Wuppertal. During the first graphic workshops in 1998, a group formed that has since been renamed as “TallerContil.” Participants and group members are not professional visual artists, but interested and talented people from other, and sometimes with several professions: theater people, teachers, agricultural technicians, mechanics, students. Indigenous artist’s books are not only enjoyable as pieces of art but they can be studied to understand indigenous techniques applied to the creation of these books. The study of these objects offers an opportunity to see the ways that indigenous people adapt their techniques with other culture’s printing techniques, and how collaboration emerge between them and artists from Germany, the United States or Japan. But beyond looking as these objects as works of art, studying these artist’s books allow social scientists to introduce students to concepts such as globalization–these objects are created for the world market not the local economy; indigenous empowerment–indigenous women participate in these workshops as a different way to earn money and self-esteem; and language preservation, since indigenous languages such as Mayan are used for the short stories and poems printed in these books. We invite you to come and visit the Dodd Center for a closer look to these amazing books. The lantern slides of Winners in Girls’ and Boys’ 4-H Club Health Contest, 1923 are part of the Albert E. Wilkinson Collection, Cooperative Extension Service Records. Wilkinson began serving as Extension Vegetable Gardening Specialist in 1930 and performed the extension duties of the Horticulture Department at the University of Connecticut. Explore the collection guide for the Cooperative Extension Service Records. Takes your breath away, doesn’t it? 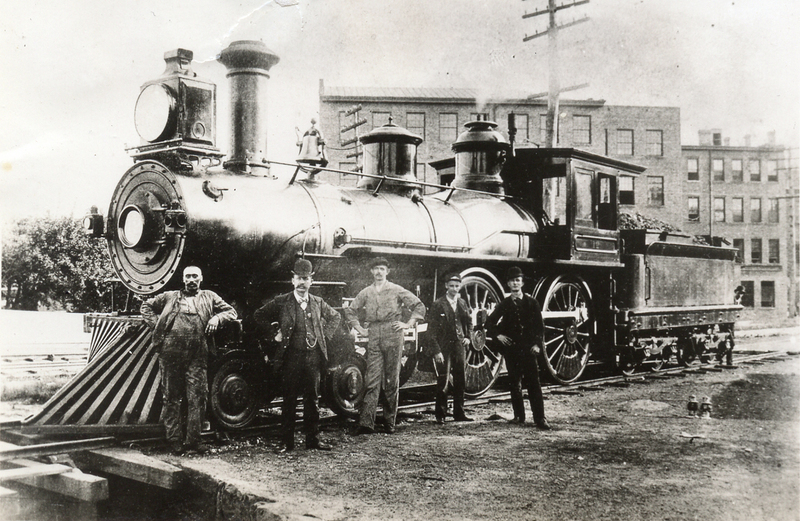 Railroads came on the scene in the United States in the early 1830s and immediately took hold of the national psyche, changing concepts of speed and time and providing limitless possibilities of the movement of agricultural products, goods of industry, and people to all points across the country. The railroad was the means that brought the Industrial Revolution to the United States, ushering in the modern world we know today. To the people of the 19th century, the railroad was a dream, a miracle, a danger, and the most marvelous thing they had ever seen. The Railroad History Archive has many thousands of photographs. Most focus on locomotives and scenes of the New Haven Railroad, the predominant railroad line in southern New England from 1872 to 1968. We have photographs of railroad stations and other structures, railroad yards, passenger cars and dining cars. We have photographs of railroad bridges, railroad tunnels, and railroad trestles. But few photographs are as evocative as the one above, where railroad men pose with the nation’s new obsession. Ozoplaning with the Wizard of Oz (Chicago: Reilly & Lee, 1939). By Ruth Plumly Thompson, illustrated by John R. Neill. 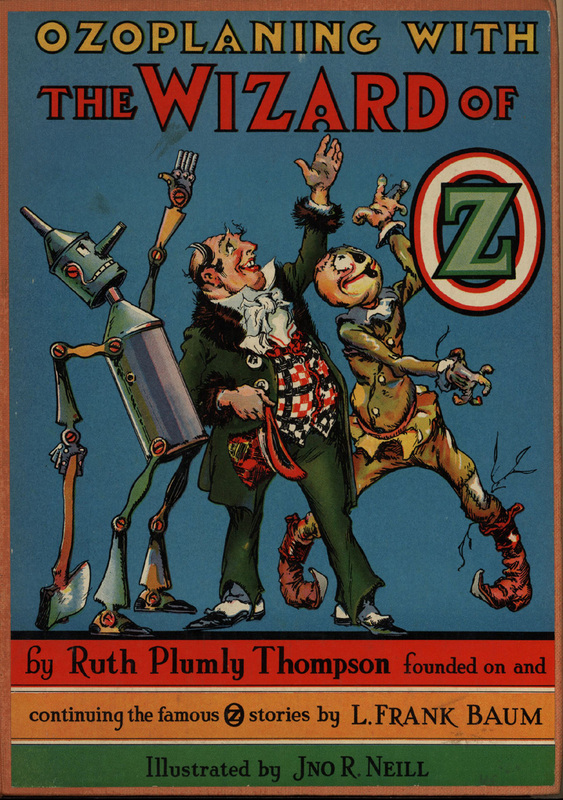 Following the death in 1919 of L. Frank Baum, the author of the original The Wonderful Wizard of Oz, Ruth Plumly Thompson was hired by Baum’s publisher to continue the Oz series. Ms. Thompson of Philadelphia wrote one Oz book a year from 1921 to 1939 when Ozoplaning with the Wizard of Oz was published by Reilly & Lee. The phrase “The Wizard of Oz” was added to coincide with the release of the movie, The Wizard of Oz, by MGM the same year. The illustrator is John R. Neill, who illustrated many of Baum’s Oz books after Baum and the original illustrator of the The Wonderful Wizard of Oz, W. W. Denslow, parted ways after a dispute over royalties. Neill wrote three Oz books after Thompson resigned from writing the series in 1939. This story contains the original characters, Dorothy Gale, the Tin Woodman, the Scarecrow, and the Cowardly Lion and of course the Wizard of Oz. Jellia Jam (“Jamb” in the original Baum) is the Wizard’s “pretty little serving maid” who does not appear in the movie version. The Soldier with Green Whiskers and Nick Chopper join everyone for a dinner party at the Wizard’s home so the Wizard can show off his new inventions, two Ozoplanes named Ozpril and Oztober. The Soldier, Tin Woodman, and Jellia board the Oztober and through the Soldier’s bad luck, take off through the roof on a long adventure. 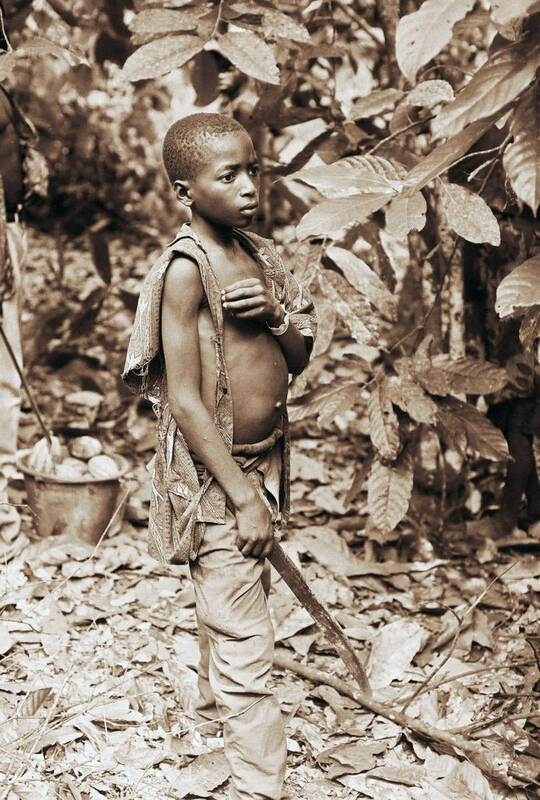 A child laborer picks cocoa pods in the Ivory Coast. Photograph by U. Roberto Romano, 2006. Image from the Romano Human Rights Digital Photograph Collection, Thomas J. Dodd Research Center, University of Connecticut Libraries. Photograph by U. Roberto Romano, 2006. The West African country of Ivory Coast is the world’s largest producer of cocoa, with over 40% of the world’s production. Despite the signing of the Cocoa Protocol in 2001, child labor is still rampant in the cocoa industry, often involving the illegal trafficking of children from Mali and Niger to work in the cocoa fields of Ivory Coast. Children as young as seven work in the fields, facing dangerous tasks of cutting down cocoa pods with machetes and carrying heavy loads. Most children are never paid for their work. American photographer and documentary filmmaker U. Roberto (Robin) Romano has documented human rights issues for advocacy organizations around the world including GoodWeave, Amnesty International, Human Rights Watch, The International Labor Organization, Stop The Traffik, The Hunger Project, The Farm Labor Organizing Committee, Council on Foreign Relations and Antislavery International. Romano’s most recent film, The Dark Side of Chocolate (2010), co-directed with Danish journalist Miki Mistrati, documents the continued allegations of trafficking of children and child labor in the international chocolate industry, despite a voluntary protocol to end abusive and forced child labor on cocoa farms by 2005. However, in 2005, the cocoa industry failed to comply with the protocol’s terms, and a new deadline for 2008 was established. In 2008 the terms of the protocol were still not met, and yet another deadline for 2010 was set. Meanwhile, child labor in the cocoa industry continues. For more information, see the International Labor Rights Forum’s information on child labor in the cocoa industry. Human rights documentation is a focus of the Archives & Special Collections at the Thomas J. Dodd Research Center. More information about the Romano Papers and other human rights collections can be found on the Dodd Center’s website. Romano’s film, The Dark Side of Chocolate, will soon be available at the University of Connecticut Libraries as part of the Human Rights Film Collection, which contains approximately 500 films on an array of human rights themes. An annotated listing of films is available on the UConn Libraries’ website. Explore the Harlem Renaissance through the poetry, novels and music that emerged between 1917 and 1934, a period in American history characterized by an “unprecedented mobilization of talent and group support in the service of a racial arts and letters movement,” according to historian and author David Levering Lewis. First editions by Arna Bontemps, Countee Cullen, Jessie Fauset, Rudolph Fisher, Langston Hughes, Nella Larsen, Alain Locke, Claude McKay, Jean Toomer, Wallace Thurman, Zora Neale Hurston, and George Schuyler, as well as original pamphlets, periodicals, audio recordings and reference sources are now available at the Dodd Research Center. The rich collection of materials was recently donated to Archives and Special Collections by Ann and Samuel Charters. Among the recordings in the collection are record albums featuring poets reading their work and a rare Black Swan recording of Marianna Johnson singing “The Rosary” and “Sorter Miss You”, accompanied by the Black Swan Symphony Orchestra recorded between 1921 and 1922. Black Swan Records, established in January 1921 as a subsidiary of the Pace Phonograph Corporation, was the first record label owned and managed by African-Americans and issued material recorded exclusively by African-American musicians. Board members of the Pace Phonograph Corporation included W. E. B. Du Bois and James Weldon Johnson. The record label was named after the opera singer Elizabeth Taylor Greenfield, nicknamed “the Black Swan”. The Black Swan catalog included European classical, jazz and blues. Fletcher Henderson served as the house accompanist. 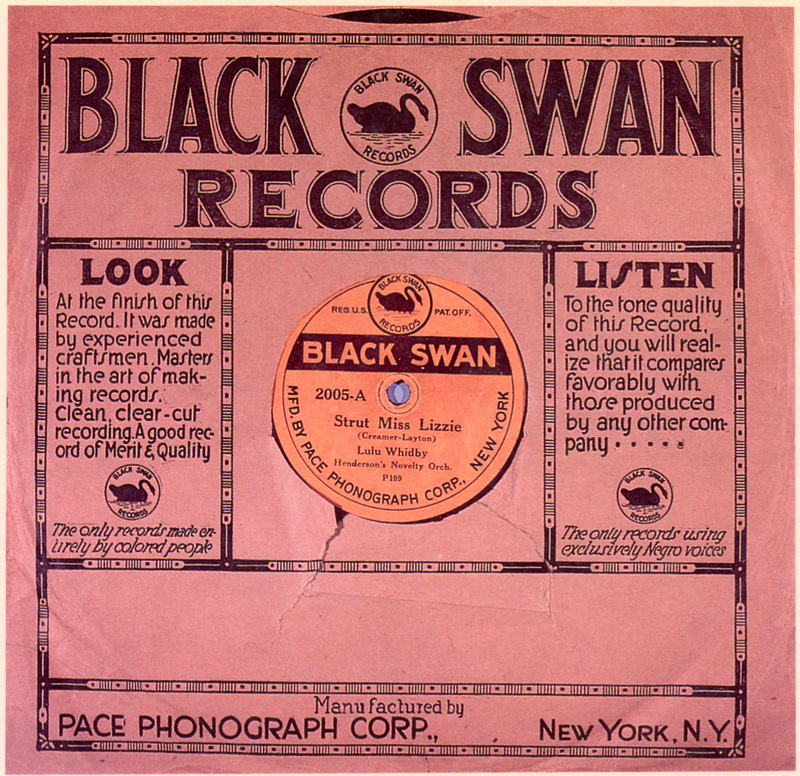 In March 1923 the Pace Phonograph Corp. was renamed the Black Swan Phonograph Co. This was the last year any new records were issued, although Pace reissued Black Swan recordings through 1926.